All ships of the period had an engineering routine and this varied from company to company but for any steam ship there was a need to keep well manned watches in engine and boiler rooms. A large passenger liner like the Titanic needed a number of engineers on each watch (12 to 4, 4 to 8 and 8 to 12, am and pm) these men supervising the firemen, greasers and coal trimmers and tending the machinery/boilers under their control. Engineers would have been on duty in the boiler rooms and the engine rooms (reciprocating engines and turbine). The Chief Engineer would not have kept a watch but the majority of the other engineers would have done so. There were six Second Engineers allowing for two on each watch, one in charge of the engines and the other responsible for the boilers. The five Third Engineers and the Senior Fourth Engineer would have allowed for a further two qualified engineers on each watch, probably supervising boiler rooms. The remaining nine Fourth, Fifth and Sixth Engineers would have allowed for a further three engineers per watch giving a total of seven engineers to each watch at sea. This would have allowed for four engineers in the engine rooms looking after the reciprocating engines, turbine and other machinery such as the pumps and steering gear, whilst three engineers would have been responsible for the boiler rooms. Firemen and coal trimmers were a tough breed and needed careful supervision; only the more senior engineers are likely to have been allocated that task as dealing with such men required experience and understanding. Authority alone was not enough to ensure that the boilers were fired correctly and that coal was always available where needed, the ability to deal with the "black gang" came from knowing their ways. At least one Electrical Engineer would have also been on each watch with the remaining three, including the Chief Electrician, on day work. The Refrigeration Engineer (extra 4th Engineer), two Deck Engineers, two boiler makers and plumber are likely to have been on day work; their work would be as directed by the watch keeping engineers or as circumstances required. As Titanic was on its maiden voyage careful attention had to be paid to the machinery, particularly the reciprocating engines and these will have gradually been run up to full power over the duration of the voyage. The full power run planned for 15 April was not an attempt to break any record but simply to check that the engines could achieve the designed power consistently, having been run in during the first part of the voyage. 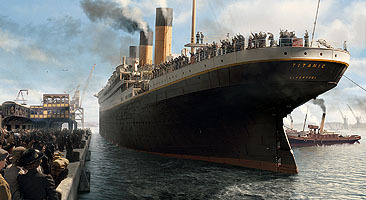 There was no chance of Titanic breaking the "Blue Riband", she was simply not powerful enough. Mauretania and Lusitania required some 75,000hp to propel their smaller tonnage at record speeds and the most that Titanic's engines could produce was about 45,000hp. During the voyage the engineers in the boiler rooms would have had the task of supervising the operation of the boilers and ensuring that bilges were kept clean, ashes disposed of and boiler water treatment chemicals correctly administered. The engineers in the machinery spaces would have had the task of checking the operation of the main and auxiliary engine, including the electrical generators and steering gear, and making adjustments as necessary. They would also have been responsible for ensuring that bilges were kept pumped, fresh water and heating was available in the passenger spaces and that shaft bearings and thrust blocks were effectively lubricated. Obviously, if any defect or problem was encountered engineers would be directed to dealing with that and so the designation of specific duties at any time is not really possible. The filling in of the log book each watch would generally fall to the most junior engineers on the watch. A bunker fire was burning whilst Titanic headed west and coal trimmers would have been supervised in their attempts to locate the heart of the fire and bring extinguishing media into operation. At the main reciprocating engine maneuvering platform were grouped all engine controls and from the one position the engineers could operated the engine steam supply valve, reversing mechanism and bridge telegraph. The turbine only operated in the ahead direction and during maneuvering was not used, reciprocating engine exhaust steam being diverted to the condensers. Reversing of each reciprocating engine was achieved by moving that engine's valve link block and a steam cylinder was provided for this purpose; all that the engineer had to do was to operate a steam control lever and the reversing engine would do the work. A similar steam cylinder was employed to operate the two changeover valves which directed reciprocating engine exhaust steam to the condensers or turbine. This steam cylinder was located at the after end of the reciprocating engines and it is possible that its control was located at that position. The engineer on the main controls could not, therefore, operated the changeover valve without moving position (about 30ft) but under normal circumstances there would be other engineers available to do that job and it was only necessary to operate the valve once, at the commencement of maneuvering when entering port or when "full away" when leaving port. Contact between the engine and boiler rooms was essential in order to ensure that the boilers supplied the steam required by the engines; insufficient steam generation resulted in low boiler pressure and loss of power whilst excessive steam generation meant waste of steam as the safety valves lifted. Titanic was fitted with the latest devices to ensure satisfactory communication between the engine control platform and the boiler rooms. The bridge telegraphs only operated at the reciprocating engine starting platform (port and starboard engines) but there was a system of illuminated telegraphs between the engine starting platform and the individual boiler rooms. This electrically powered equipment was supplied by Messrs. Evershed & Vignoles Ltd. of London and consisted of a transmitter unit at the engine control and receiver units in each boiler room. This equipment enabled the engineer on engine room watch to communicate with the boiler rooms thus informing them as to the actual operating speed of the engine, Full, Half, Slow or Dead Slow. (The equipment probably provided an audible warning as well as the visual indication.) There was actually no need for the boiler rooms to know if the engines were turning ahead or astern and the equipment may not have had any means of informing the boiler rooms of this. In addition to these boiler room telegraphs the same firm also supplied sets of Kilroy stoking indicators for each stokehold. One indicator was provided for each boiler and the engineer could set the rate of firing required for each boiler by adjusting the time each furnace on a particular boiler was to be fired; a visual and audible signals warned the fireman when each furnace was to be fired. With the double ended boilers there was a facility in the system which prevented opposite furnace doors being opened at the same time. My R.M.S. Titanic : Engineers Page!